A Great African Kingdom Created Fabulous Fashion As A Political Tool : Goats and Soda An exhibition at the Baltimore Museum of Art finds political power in dizzying patterns from the Kuba Kingdom — located in what is now the Democratic Republic of the Congo. 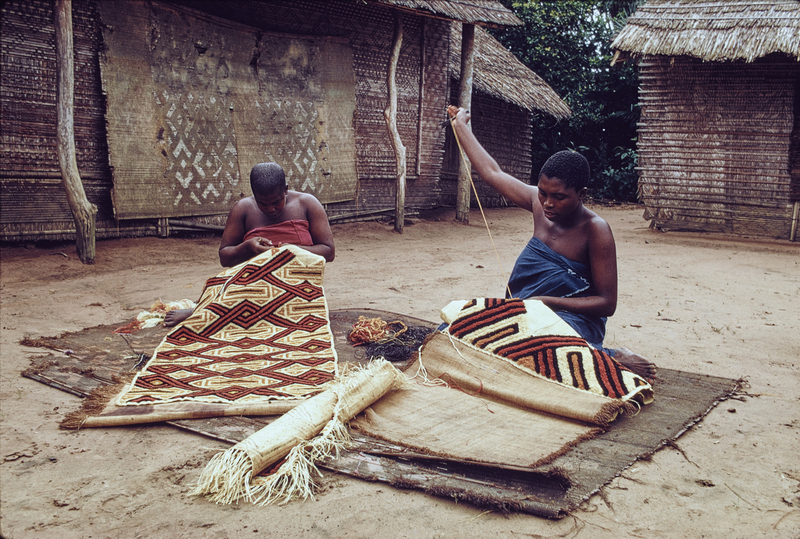 Kuba women decorating woven cloth in the Democratic Republic of the Congo, photographed in 1970. In the past, women were the main creators of the legendary Kuba textiles. What can an old piece of cloth tell us about the rise and fall of a kingdom? Quite a lot, if you know how to read it. That's the premise behind a new exhibition at the Baltimore Museum of Art titled "Kuba: Fabric of an Empire." It features an array of captivating patterned textiles from the Kuba Kingdom, which between the 17th and early 20th centuries was one of Africa's largest and most powerful societies, controlling trade in ivory and rubber in what is today the southeastern region of the Democratic Republic of the Congo. The Kuba were renowned for their artistry, and today any museum of African art in the U.S. or Europe is likely to display Kuba sculpture, masks, beadwork or especially textiles, which were commissioned by royalty and worn or displayed for ceremonial occasions. The textiles are made of woven and dyed raffia palm fronds and feature hypnotic geometric designs mostly in shades of black and tan. In some, the designs are stitched; in others, serpentine cutouts are appliquéd onto a raffia backing. Some are 20 feet long and meant to be worn as a wrapped unisex skirt; others are 2-foot-square panels meant to be hung on display behind a royal throne. The designs themselves likely didn't carry a literal symbolic meaning but were instead products of the creative invention of the artists, mostly women, who created them and whose names have been lost to time, travel and the DRC's troubled colonial and modern history. But they tell a story about how the Kuba's leaders asserted themselves in a changing world, says Kevin Tervala, the museum's associate curator of African art, who organized the exhibition. Tervala wanted to arrange the textiles chronologically and then compare them to the historical record. But as is often the case with African art that was removed from the continent during the colonial era, the provenance of each piece — the date and location of its origin and the name of its maker — is murky or nonexistent. So he sent samples of the textiles to a lab in New Zealand for carbon dating analysis. The method is imperfect: Carbon dating can have a margin of error of up to a hundred years, which is no big deal if you're dating a fossil but problematic when the item is no more than a couple hundred years old. Still, Tervala was able to make an informed guess about the order in which the pieces were produced. This textile would have been used as an "overskirt." It has been dated to 1736‑1799 and is the oldest piece in the exhibition. What he found was that the oldest pieces tended to be the simplest, often a single color with a subtle design scarcely visible from more than a few feet away. 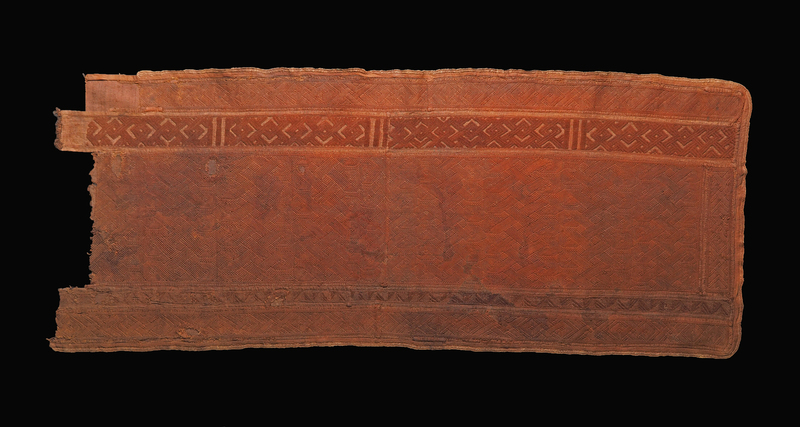 The oldest piece in the collection, which Tervala dates to the mid-1700s, is a faded blood red, with a faint border of repeating triangles. This textile, dated to 1807‑1869, would have been wrapped around the wearer as an overskirt. It is thought to be a unisex garment. Another old piece, a skirt, is cream-colored with a smattering of L-shaped appliqués. As time goes on, the designs become busier, and the colors dial up their contrast. Tervala's personal favorite piece, which he dates to the early 1900s, is an explosion of popping black-and-white angles arrayed in an off-kilter grid. 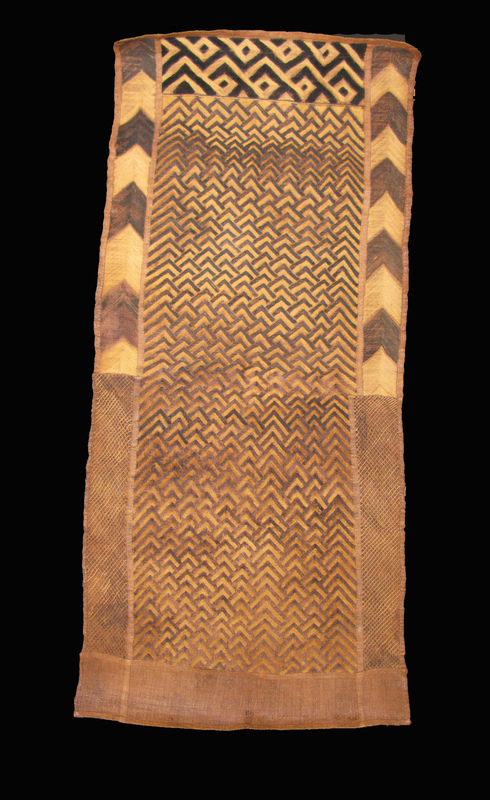 This assertive pattern, dated to 1912‑1942, shows how Kuba fabrics were meant to reinforce royal power by capturing the eye and not allowing it to rest. This evolution of design is closely linked to how Kuba elites projected and even attained, political power, Tervala suggests. Throughout the 17th and 18th centuries, ivory made the Kuba kings fantastically rich, and they invested their wealth in bespoke ceremonial wardrobes that broadcast their wealth to their subjects and to other elites. Kuba royal succession was not always patrilineal but was instead a perpetual heated jockeying for power reminiscent of "Game of Thrones." Royal ceremonies and parties sometimes had the feel of a runway showdown, with elites competing to see whose patterns were most unique and impressive, Tervala says. Designs needed to scream and to be heard from a distance. They were engineered to capture the eye and not allow it to rest. The best designs were reserved for the king; more quotidian patterns filtered down to the masses. Tervala argues that the need to publicly and aggressively assert power drove textile design, especially as, in the mid-to-late 1800s, the kings began to reckon with a new threat: Belgian colonizers scrambling for rubber. "The designs become bolder at moments when visualizing power and visualizing authority become more important," Tervala says. "As the economy changes and power erodes [because of Belgian colonial pressure], the pomp and circumstance gets boosted up. That's when you see Kuba elites really doubling down on pattern and visibility and boldness." The Kuba Kingdom's wealth allowed it to resist colonization longer than other parts of the Belgian Congo, where King Leopold II's mad rush for rubber resulted in the brutal murder of up to ten million Congolese, according to Adam Hochschild's seminal history King Leopold's Ghost. But just before the turn of the 20th century, as the king's iron fist was replaced by the more bureaucratic administration of the Belgian state, the Kuba kings gradually opened their doors and allowed freer trade with Europe. Kuba textiles have been hot commodities ever since. They were displayed at one of the first major exhibitions of African art in Europe, in Brussels in the late 1800s, and at the Brooklyn Museum in 1923. The French painter Henri Matisse kept some in his studio and said he would often stare at them "waiting for something to come to me from the mystery of their instinctive geometry." His 1947 paper cut-out Les Velours reportedly drew on Kuba appliqué. Kuba textiles even appeared in episodes of Grey's Anatomy and Frasier as archetypes of African fine art. Market demand also drove Kuba artists to take on bigger and bolder designs, especially after the DRC gained its independence in 1960, says Elisabeth Cameron, an art historian and Kuba specialist at the University of California-Santa Cruz. "Kuba artists were definitely savvy in how they created designs and the impact those designs had on their audiences, whether that audience be the Kuba peoples themselves or colonial officials who witnessed the Kuba courts and performances or in published photographs that appeared throughout Europe and the USA," she says. "The visibility of bold designs is important in reinforcing the political power that was slowly disappearing. It's exciting to see a new take on Kuba textiles that acknowledges that the Kuba as a people were not passive in the face of colonization — not victims." Artists in the DRC's Kasai province still produce textiles based on popular historic designs. 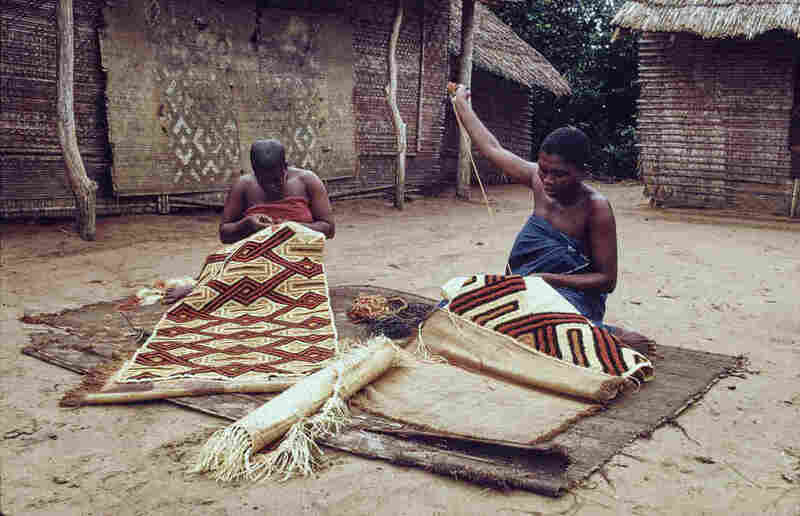 But well-preserved historic Kuba textiles like those in the exhibition are increasingly rare, Tervala says, because the raffia material is prone to disintegration, especially in the DRC's tropical and savanna climates. Those on display have survived in part because, as expensive ceremonial costumes, they were worn infrequently and taken well care of. And although the patterns themselves were aggressively unique, in some ways the story they tell is familiar. "Fashion is always linked to status and authority in some way," Tervala says. "This is a Kuba spin on a universal tale." Kuba: Fabric of an Empire is on display at the Baltimore Museum of Art through February 24, 2019.